So you got a huge document and want to move quickly between pages. Use the Go To navigator in Word 2013. Hit CTRL + G for the below and enter the page number. I know I Know – Word Clouds are so last year but I still enjoy designing using them. From a background or just for fun they so cool. I use http://www.tagxedo.com/app.html to generate mine. Check out my latest one below. – Go to File > Options > Advanced. 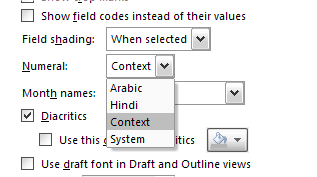 – Scroll down to the Show document content section – you will find the Numeral option. Set it to Context.